Strategically placed astride the London Road, guarding an important crossing of the River Medway, this imposing fortress has a complex history of destruction and rebuilding. Its mighty Norman tower-keep of Kentish ragstone was built c. 1127 by William of Corbeil, Archbishop of Canterbury, with the encouragement of Henry I. Consisting of three floors above a basement, it still stands 113 feet high. Attached is a tall protruding forebuilding, with its own set of defences to pass through before the keep itself could be entered at first floor level. In 1215, garrisoned by rebel barons, the castle endured an epic siege by King John. Having first undermined the outer wall, John used the fat of 40 pigs to fire a mine under the keep, bringing its southern corner crashing down. Even then the defenders held out within the building, until they were eventually starved out after a resistance of nearly two months. Rebuilt under Henry III and Edward I, the castle remained a viable fortress in the 15th century, but a century later it was decaying. Today it stands repaired as a proud reminder of the history of Rochester, along with the nearby cathedral and Dickensian cobbled streets. The Roman camp here, on the right bank of the Medway at its embouchure, commanded the point where the Watling Street from Dover to London passed this river, and on a portion of its site ryas formed in Saxon and Danish times a castrum, the “Castle of Hrofe,” or Hrofeceastre, an oblong enclosure of about seven acres, including a large conical mound of the eastern chalk range, called Boley, or Bully Hill, where the customary timber fortifications were of course erected. When these earthworks fell into Norman hands their owners proceeded to fortify the position in an improved way, by enclosing with a strong curtain wall a quadrangular space near the river, and building therein in later years a large square keep ; while the Saxon burp was, as at Canterbury and Warwick, left out¬side, to be occupied as an outpost only. The Norman enceinte of the eleventh century was, so to speak, four-sided, measuring 16o yards N. and S. by 130 E. and W., its E. face fronting the then very ancient cathedral, the W. wall being built close above the river side ; the N. face probably on the edge of the Roman scarp and ditch, while the S. front faced Holey Hill, a deep ditch being carried all round the three landward fronts. The gatehouse, which has vanished, stood at the N.E. angle, with a steep causeway leading up to it, and at the N.W. corner was a bastion tower containing a postern ; this tower was standing in 1735, immediately on the shore, and commanding the bridge. The S.E. angle is held still by a large circular tower, 3o feet in diameter, in two floors and loopholed. The E. front has two rectangular mural towers of later work ; only some portions remain of the curtain walls, chiefly of Norman date, particularly on the N. side. The most celebrated part of this castle is the keep, which stands near the S.E. angle of the enclosure, where the ground is highest ; and outside is another tower which formed the boundary of the city, being the work of Gundulf, the friend of Lanfranc, consecrated Bishop of Rochester in 1077, who, being a great architect and a very learned man, was called on by King William to erect this tower. It is probable that the rest of the Norman fortifications were carried out at about the same time—at all events, at the Conqueror’s death it was a very strong fortress, and was seized and held by the much hated Bishop Odo. His half-brother, Earl of Kent, acting on behalf of the King’s eldest son, Duke Robert, associated with him Count Eustace of Boulogne and Robert cue Beleme, and garrisoned the castle, which was besieged and captured in 1088 by the Red King after a long blockade of six weeks. Odo was sent by his nephew prisoner to Tonbridge, being some time after set at liberty on condition of quitting the realm. The castle was probably much injured in this its first siege, and we find that Bishop Gundulph was called on by the King to expend £6o in building a new tower ; it is possible that this bishop architect, who had built his cathedral at Rochester, and was taken to London to build the White Tower there, should have furnished the plans of the mighty keep by the Medway, erected soon after. He died in March 1108, aged 84. In 1126 Henry I. granted to Walter de Corbeuil, Archbishop of Canterbury, the constableship of “the Castle of Hrof,” with permission to build a tower, and then it was apparently that the existing keep .was reared. It was here that Robert, Earl of Gloucester, the half-brother and defender of the Empress Maud, was confined after his capture on the retreat to Ludgershall, Wilts (q.v. ), in 1141, until exchanged for King Stephen. The castle was repaired in 1167 and 1202. Henry II. had taken Rochester Castle from Becket’s keeping, but it was restored afterwards to Archbishop Langton, who, in 1215, placed it in the keeping of William d’Albini, to be held in the interest of the barons; but before they could send a force to assist him King John marched against the place with a strong battering train and besieged it for three months. Roger of Wendover says that the military engines employed did little harm, the great injuries being effected by the undermining of the walls and towers, by which the tower of the S.E. angle was no doubt destroyed. Next year the castle fell an easy prey to the army of the Dauphin, who, at the death of John soon after, handed it over to his son, Henry III. This king spent large sums upon it, but as in the case of other castles, the work, as shown in the Liberate Rolls, was generally in improving the domestic dwellings and arrangetnents, in halls and chapels, painting, wainscotting and whitewashing, work which for the most part has perished. 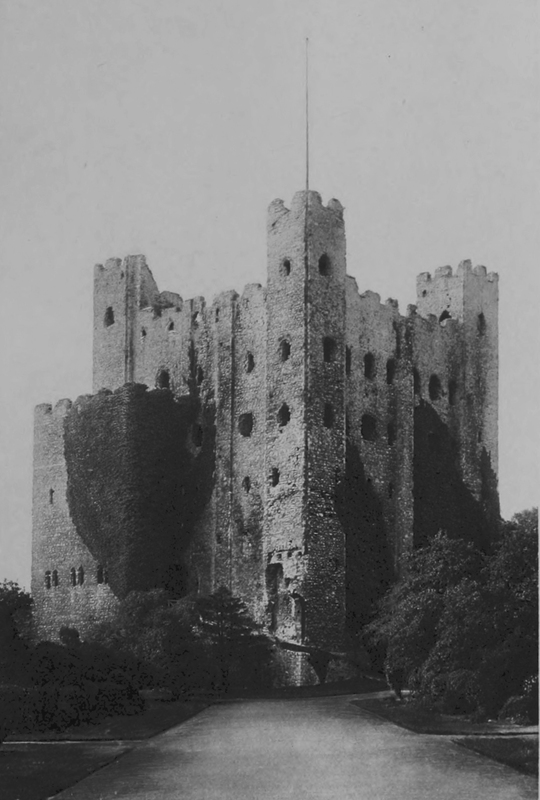 Rochester Castle was never again a part of the See : in 1264 Henry caused it to be strengthened and furnished with everything necessary to sustain a siege, Roger de Leybourne being castellan or constable, and having John, Earl de Warrenne, with him. Soon after, Simon de Montfort proceeded to besiege the fortress, but on arriving from London at the Medway he found a hostile Royal army ready to dispute the passage, whereon he sent Gilbert de Clare, the young Earl of Gloucester, round to invest the town on the S., while he proceeded by the aid of fire-ships to burn the bridge, or scare its defenders. Then he managed to cross in boats and attack the castle. After seven clays of assault, in which he made little progress, the King, by threatening London, obliged him to raise the siege. Edward III. repaired the walls in 1367-8, and during the rebellion of Wat Tyler the castle was attacked and partly taken. Thomas, Lord Cobham, was its constable from 1413 till his death. It was again repaired by Edward IV. about the eleventh year of his reign ; but after that date little attention was paid to the fabric, which fell by neglect into decay and ruin, nor has it any place since in military history. A drawing of it in 1588 shoes its four turrets domed and capped with vanes like the White Tower. In 1610 the castle was alienated from the Crown by James I. to Sir Anthony Weldon, whose family held it long. At last, in 1883, it was purchased by the Corporation of Rochester, and thrown open to the public. The fabric and the grounds around are now carefully tended. A long time previously all that was movable in the old structure, the oak flooring joists, the roofs, and such stones as could be extracted from the building, had been purchased and removed, it is said, for the construction of a brewery. The chief interest, of course, centres on the ruined keep, which is a square building of about 70 feet each way and 113 in height, its walls being 12 feet thick, reduced to to feet at the top, above which the turrets rise another 12 feet. The angles are supported on both sides by flat pilasters, of which there is also one on the centre of each face, the S.E. angle being rounded and projecting. There is a centre wall, as in the Tower of London, which divides the whole structure into two nearly equal parts, running E. and W., and rising to the roof level; in the centre of this, from bottom to top, rises the well shaft, communicating at each floor for the water supply. The basement is attained, as at London, by a well staircase, in the N.E. corner, which is carried from the lowest level to the roof, leading to each floor, and to the mural galleries, which, as in the White Tower, are allowed by the great thickness of the walls. Both the basement and the first floor, which may have been for stores or lodgings for soldiers, are lighted by loopholes only. The floorings were all carried by timber joists. The main, or state floor, was 32 feet in height, with taro tiers of windows, the upper tier having a mural passage in front of them. On this floor the centre wall is pierced with four arched openings, from one chamber to the other, and a large doorway on the N.E. corner gives access to an oratory, or chapel, built over the external vestibule. A flight of steps approaches the mural gallery, which is carried completely round the tower, being 3 feet wide and vaulted, as at London. These two rooms must have been draughty, and public, and inconvenient to a degree, as was the Council Chamber in the White Tower ; one room may have served as the hall. From the gallery twenty-three steps lead up to the top floor, containing two handsome rooms 25 feet high, with larger windows and a fine view ; and above this floor are the battlements, which had a rampart walk.